But concerning the nature of the profound insight that Humboldt gained on top of Chimborazo, can we still hope for a genius that would one day be able to comprehend the conditions of our modernity? It seems that humans of the 21st century are stuck in the pace of progress of technology, greedy corporations, degenerate politicians, genetics, medicine, etc. — and we are no longer able to come up with a unified concept of all the processes that are happening here, right now — in the present. All knowledge today is fragmented into ideas and theories that are chained to scientific and pragmatic disciplines. At our age, scientists and humans in general, resort to compartmentalized forms of thinking that has long dismissed the act of contemplation . 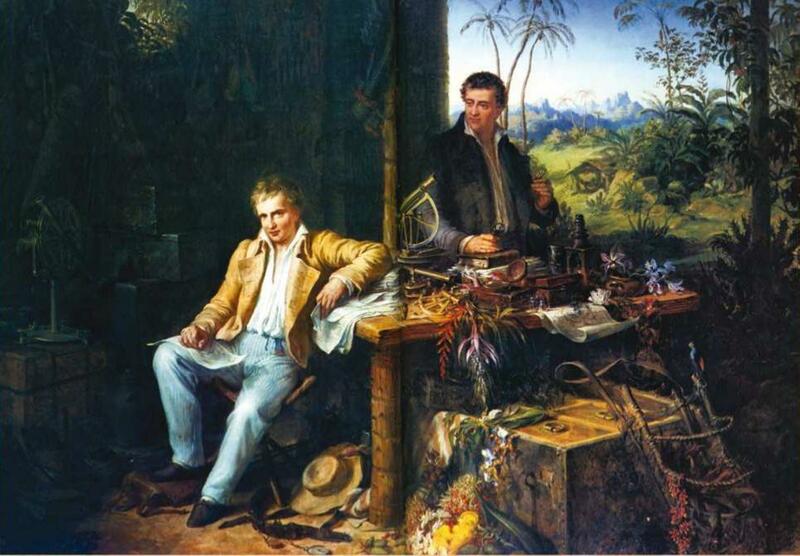 Humboldt and Bonplant during their travels through the Amazon rainforest. In other words, we probably won’t know — and most likely never will know — what peak we ought to climb to fully comprehend our modernity. If Humboldt conceived nature in an unprecedented way, which made him to affirm that climate change is a consequence of human activity, how — and most importantly what do we need to apprehend in order for us to finally say: “Aha! This is what all this means”? But perhaps, we can ask astronauts who have flown to space and try to get an answer from them. The International Space Station orbits at 400km, 70 times higher than the mountain Chimborazo. But it seems that getting higher is not sufficient for grasping the present conception of modernity, which humans are desperately seeking. We must somehow go wider, but no human today seems to have the capacities to do so. But even if we hope to encounter another genius one day, what kind must he be? A naturalist like Humboldt? A philosopher like Kant? An ideologue like Marx? A physicist like Einstein? We are likely to never have an equivalent of these geniuses that could grasp the whole state of our modernity as Humboldt grasped Nature during his time. It is not that no person will ever have the comprehending capacities of Humboldt and the other mentioned geniuses; it is just that human anthropic processes have become excessively complicated for a single human to formulate in one coherent idea. The question of modernity has become largely digitized, technologic, economic, and globalized. To have a good view of this, it is not enough to find a metaphorical high ground like Humboldt did on Chimborazo; but it also seems to require a faculty of comprehension that no single human seems to be capable of providing. Our modernity can only be scarcely conceived in a collective; where each one of us is somewhat engaged in a specialized, compartmentalized, and fragmented study of natural and anthropic phenomena — but in which we can hardly step back and comprehend everything as a whole.